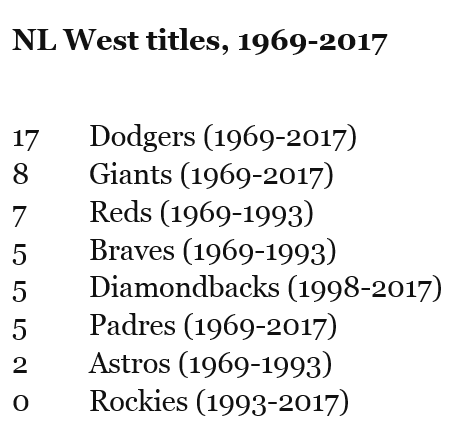 Though the ultimate prize has eluded the 21st-century Dodgers, Los Angeles enters 2018 trying to become the third team in the division era (now entering its 50th season) to win at least six straight division titles, after only the 1998-2006 New York Yankees and the 1995-2005 Atlanta Braves. 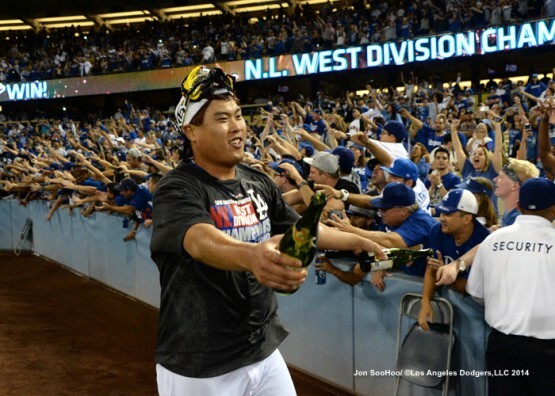 The Dodgers’ path to five consecutive division titles hasn’t been without its speed bumps. In 2013, the Dodgers were in last place with a 30-42 record, 10 games behind the Giants, in late June. They went on their famous 42-8 run, but probably didn’t have what you would call a comfortable lead in the National League West until late August. In 2014, the Dodgers were playing better ball in the first half of the season, but still were 10 games back after a walkoff, extra-inning loss at Coors Field. Los Angeles was only two games ahead of San Francisco with 10 to go, then won eight of those 10 — including a Clayton Kershaw masterpiece over the Giants to clinch the division in Game 159. In 2015, the Dodgers were in first place from mid-April until, with the exception of one day, the end of the season. But for the first five months of the campaign, their biggest lead was five games, and after being swept in Houston in late August (Mike Fiers’ no-hitter included), their margin over the Giants was as low as 1 1/2. In 2016, for the third time in four seasons, the Dodgers had to stage a major comeback — this one from an eight-game deficit on June 26, with Clayton Kershaw on the disabled list. Not until they won two of three from the Giants in mid-September (the first of those with a two-run rally in the bottom of the ninth) did they have the breathing room of a six-game lead with 10 to play. 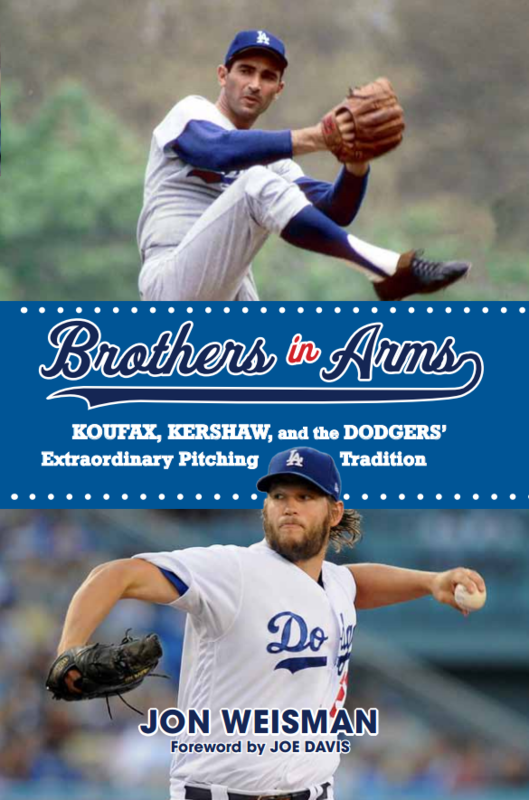 What made me think to write this little piece was recalling how the 2017 Dodgers began their season 9-11, quickly falling five games behind — no, not San Francisco, not Arizona, but Colorado. That the upstart Rockies were the team that had raced out to a big lead might have been comfort to some, but plenty of others despaired over the Dodgers’ apparent mediocrity. Of course, as we know, the Dodgers then got supremely, 82-25 (.766) hot, to the point that even their horrific 1-16 slump on either side of Labor Day didn’t matter. Still, Colorado and then the Diamondbacks were enough of a nuisance that when the Dodgers took the field (against Arizona) on Independence Day last year, their lead in the NL West was a slight 2 1/2 games. That means for the first three months of the season, Los Angeles was in breath-holding mode. The MLB season is so long that even for the best teams, it’s practically inevitable that your heart will suffer at some point. Don’t despair.